The luminous quality and shimmering colours in this gorgeous pair of earrings from Carrie Elspeth make them perfect for evening wear, but their beauty may want you to wear them every day! 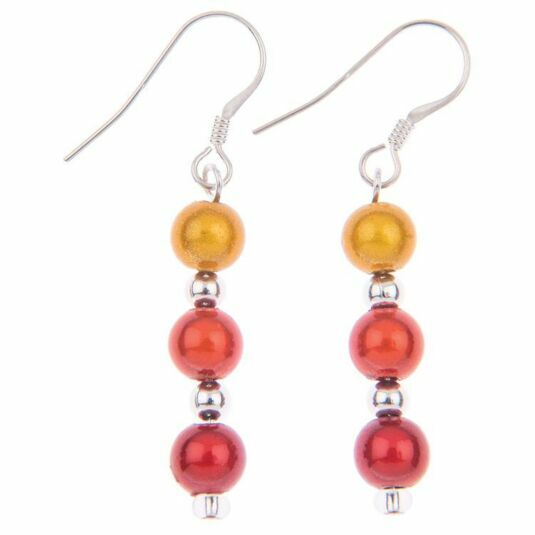 The beads are a classic pearl shape, shining globes in warm tones, separated by small silver coloured spacer beads to allow each colour to be fully revealed. The richly coloured earrings are ideal for parties and special events, and will also brighten an everyday outfit. Combine with matching items to create a sophisticated look! Beautiful items of jewellery in their own right, these earrings are also designed to work with the matching necklace and bracelet to bring the whole set together. The beads are suspended in a trio in colours shading from yellow through orange to red. The jewel-like colours revive and update the classic string of pearls, breathing new life into a wardrobe staple. Carrie Elspeth earrings always have sterling silver hooks for your comfort.